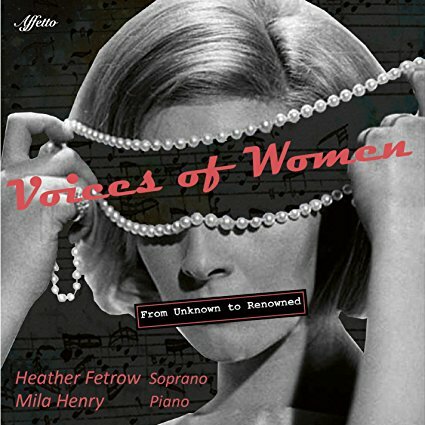 Voices of Women: From Unknown to Renowned began as an idea in a workshop soprano and album producer Heather Fetrow attended called The Twenty-first Century Singer with Soprano Susan Mohini Kane in Los Angeles in the summer of 2016. The focus of the album grew further to encompass the goal of honoring female composers as a result of a collaboration with renowned soprano Dr. Julianne Baird in Philadelphia in December of 2016. These events coincided with the Women’s March in Washington DC the next month in January of 2017, lending a sense of timeliness to the project. The focus of an album of songs by women composers and other songs about women is unique, and brings to the fore the vast social change the world is undergoing with respect to woman in our society, both here in the United States and elsewhere around the world. Each piece addresses this separately from different points of view, in some cases from a previous age where the standards of women’s expectations were very different than today. And the World Premiere of “Still” by outstanding and innovative composer Paola Prestini, sung as a duet by sisters, brings the album’s concept full circle with a song composed for and dedicated to this album. Also included are two piano pieces performed by Mila Henry, both by female composers, “Light” by Iranian composer Gity Razaz and “No. 2” from “Nine Short Piano Pieces” composed by Ms. Henry’s mother-in-law. In all, this is an album for the age of the woman and about the age in which we live.